This blog focuses on food, art, and music among Vancouver’s immigrant/cultural communities. Nazism in Berlin: Is It Still Relevant? While studying at a café in Prenzlauer Berg, I began to hear protestors walking through the streets in demonstration. They wore metallic clothing, played loud music, and held signs that read ‘Berliners against Nazism’. As a foreigner, it initially seemed redundant that Germans would be protesting against Nazi ideologies in 2017. My education had led to me believe that Nazi ideologies were no longer apart of the political dialogue and German culture was in complete disassociation with such beliefs. Unfortunately such assumptions do not accurately portray the political ideologies of some Germans. While living in Berlin and studying German memory culture, I have had the opportunity to learn more about the complexities surrounding Holocaust memorialization. Conflicting opinions on the Holocaust, as well as the extent to which it should be remembered, accounts for issues surrounding contemporary exhibitions. It is interesting to note that the famous ‘Memorial to the Murdered Jews of Europe’ was only completed in 2005 after years of deliberation on representation and the structure itself. It is clear that memorialization of the Holocaust, specifically the atrocities that occurred, is a relatively recent phenomenon. It is important that the international community recognize the politics surrounding remembrance. One should not assume that memorialization is inevitable; rather it is a conscious decision for one to remember. I hope to further my education on the politics of German memory culture and create a dialogue around the importance of remembering the atrocities of World War II. Are We As Tolerant As We seem? Adrienne Clarkson wrote a compelling article addressing an important issue in Canadian culture: we are not immune to racism. In an address made at a citizenship ceremony at Rideau Hall, Clarkson addresses the racist initiatives historically put forth by the Canadian government. Clarkson also discusses the growing issue that stems from our proximity to the United States and the problematic rhetoric surrounding it. The recent attack on the Quebec mosque has appalled Canadians nationwide, yet has also forced Canadians to questions a fundamental value of our culture: are we as tolerant as we believe? As a UBC student, my immediate community of academics and students promote tolerance of all cultures. In my experience, intolerance of different ethnicities or sexual orientations is considered socially taboo and thus hateful rhetoric is not commonplace. However my socio-cultural understanding is simply a reflection of my social surroundings and is in no way reflection of the ‘Canadian’ social climate. Canadians residing in tolerant communities must recognize the multiplicity of views within our country. It would be problematic to suggest that racist ideologies are not held by Canadians and furthermore ignoring our countries historically racist legislation. I hope that Canadians began to think critically about the necessary steps in combatting systematic racism. By recognizing the variety of views held in our country and creating dialogue around this topic, we are choosing to acknowledge our past and beginning to create a future where all cultures are tolerated. My name is Katherine Akladios and I am a fourth year Religious Studies student at the University of British Columbia. 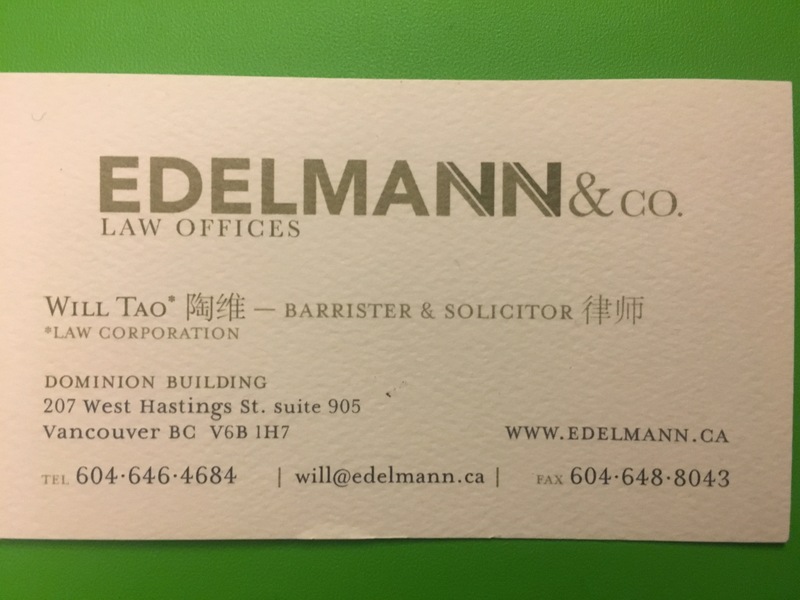 I had the pleasure of meeting Will Tao at a Pre-Law career event last year. Will spoke candidly about his experience as an immigration lawyer, as he elaborated on his work and his experiences as an immigrant. Our discussion at the event prompted my interest in the field and to further understand the experiences of immigrants in Vancouver. As a first generation immigrant, I have been brought up in the intersection of multiple cultures: Portuguese, Egyptian, and Canadian. I believe my ethnicity has allowed me to engage in differing cultures, but has also allowed me to develop an appreciation for the variety of cultures within Vancouver. Through this blog I hope to highlight the contributions of the immigrant community in Vancouver. Our city is a mosaic of cultures and our diversity should be celebrated! I look forward to creating a platform for which this is showcased.